I hope that in all your lives you will be like one sun shining in this world, that the plants enjoy—to rise up from small flowers to big flowers—and that animals can enjoy, and people too. May your life be most beneficial, right up to enlightenment. Please pray like this—to be like a wish-granting jewel or a wish-granting tree, so that whatever you pray for is granted. Pray that you can become more than a wish-granting jewel or a wish-granting tree; pray to be useful to all sentient beings until enlightenment, to immediately fulfill all their virtuous prayers and virtuous activities, all their desires. Then when you die, you can die very happily for all sentient beings, for those who have to die because they are not free from delusions and karma, the cause of all samsara. 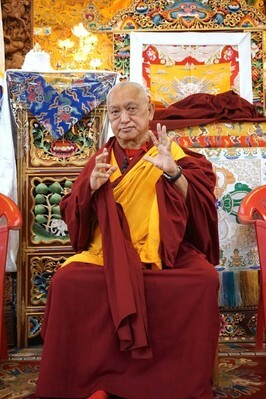 Rinpoche sent this letter to a student about the benefits of practicing Dharma with bodhicitta, the mind of enlightenment. I hope you and your whole family are very well. I am sure you are finding more meaning in your life by doing more and more continual practice of Dharma. You are really seeing your true life and I hope it is very beneficial for your mind and for all the sentient beings, as you are doing it with bodhicitta. I am very, very happy with the way you are thinking and bringing your life higher and higher to enlightenment by meditating on lam-rim, especially with bodhicitta—meditating on bodhicitta and living with bodhicitta, eating with bodhicitta, walking with bodhicitta, sleeping with bodhicitta and so on. Is there anything I can do for you, besides my daily prayer for you and for all the students and benefactors of the centers, for all the people who offer service to the organization and for all those who rely upon me, whose names are given to me, those who are living and those who have died. Please let me know if I can do anything for you. Rinpoche handwrote this card and sent it to a student with a small gift. Thank you very much for your most kind letter. You can see my right side hand which had the stroke wrote this letter. You can see! Here is one very small symbolic present that I am sending with the cards. What makes life most beneficial is living with bodhicitta, the ultimate good heart, so you are dedicated to all the friends, enemies and strangers, to cause happiness, enlightenment. 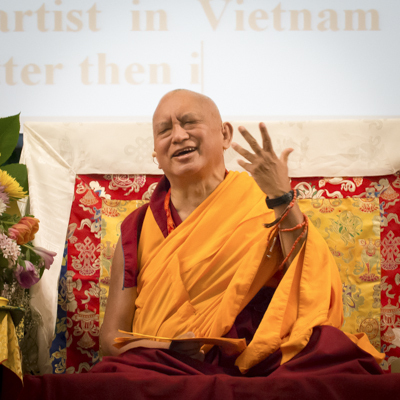 Lama Zopa Rinpoche dictated this advice during the Light of the Path retreat held in Black Mountain, North Carolina, in August 2016. 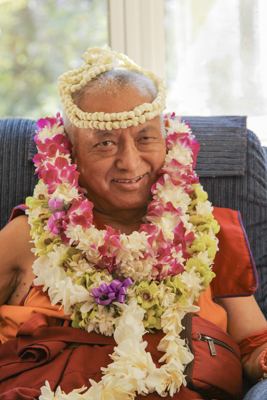 Rinpoche had it distributed to all participants and he also wanted it shared with people offering service at FPMT centers, projects and services as well as with all beings everywhere. It all depends on your motivation. If you are motivated by the self-cherishing thought, concern for only your own happiness, your own power, and have no concern for others’ happiness, your motivation is coming from your delusions, such as attachment, anger, ignorance and so forth. Then your actions of body, speech and mind will manifest as ugly, unpeaceful and hurtful to others and, as a result, others will react in an ugly, unpeaceful and hurtful way with their body, speech and mind; for example, by getting angry at you. It is like a circle. How you treat others and how they treat you in return is similar, with such negative thoughts and actions. You have to be fully aware of that in your everyday life. Generally you have to know that you are responsible to not cause others suffering but to bring them happiness. Even if you don’t think of practicing Dharma, to at least be a good human being you need to know this. You are totally responsible as to whether you bring happiness or suffering to others. It is totally dependent on your motivation and how you treat others; it’s up to you whether your motivation is pure or not. Even just to be a good person, a generous human being, you have to know that. If you have a bad motivation and your actions of body, speech and mind are harmful for others, you make others create negative karma when they retaliate by harming you in return. By harming others you therefore cause them to be reborn in the lower realms; to lose their human rebirth and take a lower rebirth and suffer for eons. Can you imagine yourself being in the lower realms? That’s where you’re causing other sentient beings to go and have unhappiness instead of enjoyment. Causes you to have a beautiful body in future lives. So you don’t need to have plastic surgery or other expensive procedures. Your positive mind can give you a pleasant, happy, smiling face and a peaceful, not a political, smile. Others will feel this and also become like that, having a good heart and being smiling and happy. Thus you always have to be aware of how others act toward you, positive or negative. It is totally dependent upon your own mind. The morning motivation, The Method to Transform a Suffering Life into Happiness, contains the details for keeping your mind positive. If you do this motivation every morning you will always act positively toward others for the rest of the day. However, first think that all your past, present and future happiness, including enlightenment, is received from every sentient being. You receive everything through the kindness of every sentient being, which includes even those people you don’t like—those who make you angry merely upon sight or when you hear their voice. It is so important to understand this evolution. Therefore you should hold all sentient beings in your heart and feel that they are most precious, most kind, most dear and wish fulfilling for you. Then there will be no way for your mind to get angry or to generate ignorance, attachment, selfishness or self-cherishing and, therefore, no way for you to harm others. You absolutely dare not harm others, even in the slightest way. Even Buddha, Dharma and Sangha—in whom you always take refuge to be free from the lower realms and get higher rebirths; to be free from samsara and achieve liberation, lower nirvana; and to be free from the self-cherishing thought and achieve the peerless happiness of total cessation of all mistakes and completion of all realizations—even this Buddha, Dharma, Sangha in whom you take refuge and who give you all this happiness come from sentient beings, including the ones that are angry at or who harm you, who speak to you hurtfully and so forth, sentient beings that you don’t like. Therefore they are all so precious, unbelievably precious to you. On top of that, they have been your kind mother from beginningless rebirths and even now; it’s unbelievable. So you have to think about this and the dependent arising I mentioned before as well. Think about these two things—it makes not harming and only benefiting others very deep. In that way your life will be only of benefit. The conclusion is that to be free from the suffering of samsara as quickly as possible and to achieve peerless happiness, the total cessation of all mistakes and the completion of all realizations, then with this thought, smile at others, respect them with your body, speech and mind and speak to them in a nice, respectful way. Treat people the way you’d like them to treat you: with respect, nice speech and smiles that come from a good heart. If you do that, then, as a result of karma, many others will treat you in the same way. Otherwise others will be angry with you, speak to you rudely and hurtfully, and harm you with the actions of their body, speech and mind. So here I am mentioning how sentient beings are most kind, most precious, most dear and wish fulfilling. Then you can really enjoy life with them, bring them much inner happiness, and in your own mind you will also enjoy much inner happiness, and that will make them happy too. His Holiness the Dalai Lama respects even ordinary people. He bends down in respect; Lama Yeshe also did this. Even when he heard about someone’s mistakes, some problems with monks and so forth, when he later met them he showed respect. Like that, this is an incredible practice, rather than feeling pride, showing arrogance and putting others down. Most people might do that, but in my experience, Lama Yeshe never did. Behaving like this is a great, great, great responsibility of the center director, secretary, board members, office manager, treasurer, spiritual program coordinator, bookshop manager and so forth. Especially these people, but in general, this is for everybody. It’s a question of karma, to not create negative karma and to create good karma. This not only makes you happy but also makes other sentient beings happy. So even with your speech you can make so many sentient beings happy. You have to be aware that there are very powerful mantras given to us by the Buddha to make our speech very powerful and beneficial for sentient beings. If in the morning you recite the Exalted Stainless Beam Totally Pure Light mantra after blessing your speech, then anybody who simply hears your voice that day, animals or people—whether they hear you singing or in any other way (not necessarily reciting mantras)—is purified of the five heavy negative karmas without break. Then if you also recite one thousand OM MANI PADME HUM mantras every morning, seven generations of your family will not be reborn in the lower realms. Moreover, when other sentient beings see you, even in places where there are many other people, just by seeing you their negative karma will be purified. Also, when you die and your body is cremated, if the smoke from the fire touches any sentient being, human, insect or whatever, it purifies their negative karma and helps them not be reborn in the lower realms. That which benefits lower sentient beings is bodhicitta. That which benefits middling sentient beings is bodhicitta. That which benefits sublime sentient beings is bodhicitta. Isn’t bodhicitta of benefit to all? If you want to look, look with bodhicitta. If you want to eat, eat with bodhicitta. If you want to speak, speak with bodhicitta. If you want to examine, examine with bodhicitta. Scribe: Ven. Holly Ansett, 17 August 2016. Edited by Nicholas Ribush. Rinpoche gave this advice to a student about how to make life most beneficial for others, now and in the future. How are you? I hope you are well and I hope everything is going well for you. Please continue to live your life with bodhicitta. I want to talk to you, when we find time. Please continue your life as much as possible with bodhicitta. Live your life for the benefit of sentient beings. This is the best use of your life, and the most happy, most beneficial life for sentient beings. This is the most happy life now and in the future, when you die and in the next rebirth, all the time.